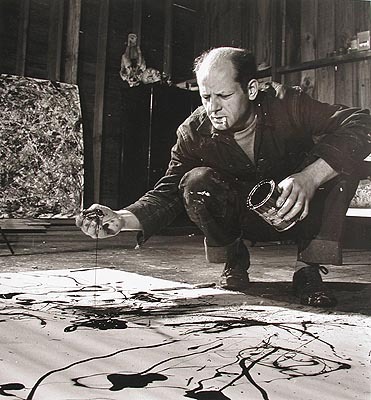 On August 11, 1956, Jackson Pollock was killed. He was involved in a car accident driving drunk and had overturned his convertible. 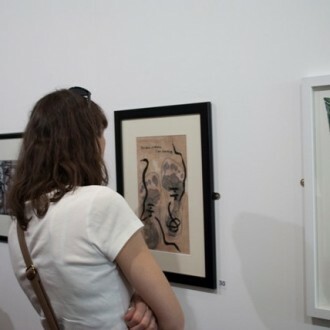 By 1955, he stopped painting altogether, when the alcohol and depression got the better of him. 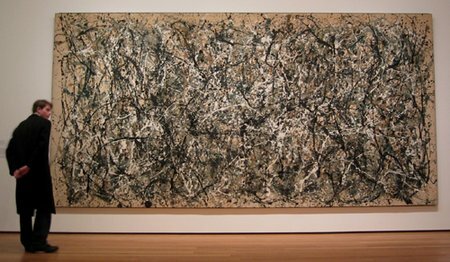 As Pollock’s work was gaining promise, he was struggling with his inner demons, but still he is one of most important artists in 20th century. He began to study painting in 1929 at the Art Students’ League, New York, under the Regionalist painter Thomas Hart Benton. 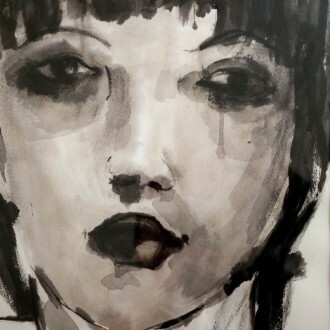 During the 1930s he worked in the manner of the Regionalists, being influenced also by the Mexican muralist painters (Orozco, Rivera, Siqueiros) and by certain aspects of Surrealism. From 1938 to 1942 he worked for the Federal Art Project. 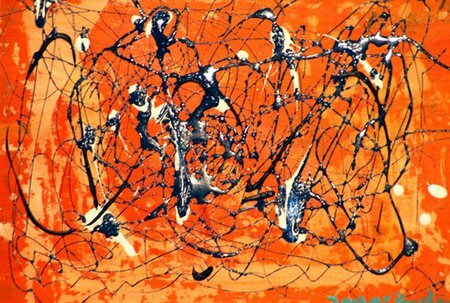 By the mid 1940s he was painting in a completely abstract manner, and the `drip and splash’ style for which he is best known emerged with some abruptness in 1947. 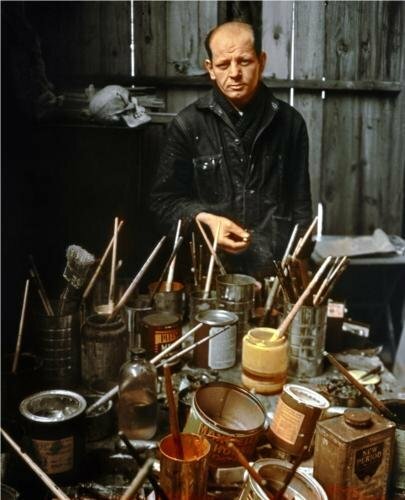 Instead of using the traditional easel he affixed his canvas to the floor or the wall and poured and dripped his paint from a can; instead of using brushes he manipulated it with `sticks, trowels or knives’ (to use his own words), sometimes obtaining a heavy impasto by an admixture of `sand, broken glass or other foreign matter’. 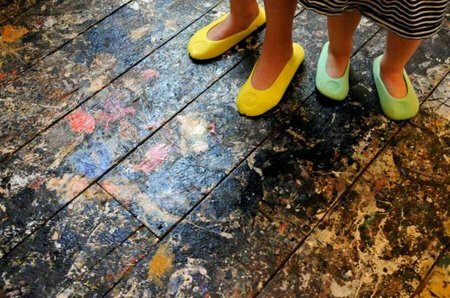 This manner of Action painting had in common with Surrealist theories of automatism that it was supposed by artists and critics alike to result in a direct expression or revelation of the unconscious moods of the artist. 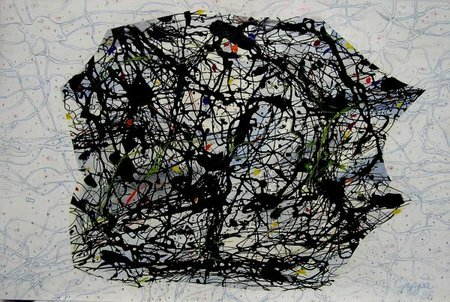 During the 1950s Pollock continued to produce figurative or quasi-figurative black and white works and delicately modulated paintings in rich impasto as well as the paintings in the new all-over style. He was strongly supported by advanced critics, but was also subject to much abuse and sarcasm as the leader of a still little comprehended style; in 1956 Time magazine called him `Jack the Dripper’. By the 1960s, however, he was generally recognized as the most important figure in the most important movement of this century in American painting, but a movement from which artists were already in reaction (Post-Painterly Abstraction). His unhappy personal life (he was an alcoholic) and his premature death in a car crash contributed to his legendary status. 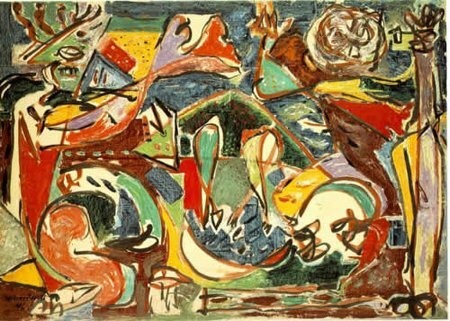 In 1944 Pollock married Lee Krasner (1911-84), who was an Abstract Expressionist painter of some distinction, although it was only after her husband’s death that she received serious critical recognition.